Egyptian and Russian search and rescue teams are continuing recovery operations at the scene of a Russian passenger jet crash in the Sinai peninsula. The Airbus A321 belonging to Russia’s Kolavia airline went down en route to St. Petersburg leaving no survivors. Kolavia Flight 9268 from Egypt’s Sharm El-Sheikh to Russia’s Saint Petersburg, had 224 passengers on board, the vast majority of whom were Russian nationals. The plane vanished from radars at 4:14am GMT, when the plane had been traveling at an altitude of 31,000 feet, Egyptian authorities said. The plane went down in a remote area of the Sinai peninsula, a region where Egyptian forces have been conducting security operations against an IS (Islamic State, formerly ISIS/ISIL) affiliate. Both flight data recorders from the crashed plane have been found, Egypt’s civil aviation minister said, and experts have started decoding the data, according to Egypt’s prime minister. No official causes of the crash have been declared yet. Search and rescue teams have reportedly found bodies up to 5km (3.1 miles) from the crash site. So far, 150 bodies have been pulled out of the wreckage, with rescuers having described heartbreaking scenes, saying many bodies were discovered still strapped to their chairs. The recovered bodies have been taken to the Egyptian capital of Cairo for identification, while DNA samples are being collected from the relatives of the deceased in St. Petersburg. Some of the victims’ bodies could reportedly be transported to Russia as early as Sunday. Sources say that the aircraft took an almost vertical trajectory as it plummeted downwards. Large parts of the fuselage reportedly burnt up in the process. On the ground, the plane seems to have broken into two parts. The country’s security forces have said that the wreckage and the position of the bodies suggest that no mid-air explosion took place. 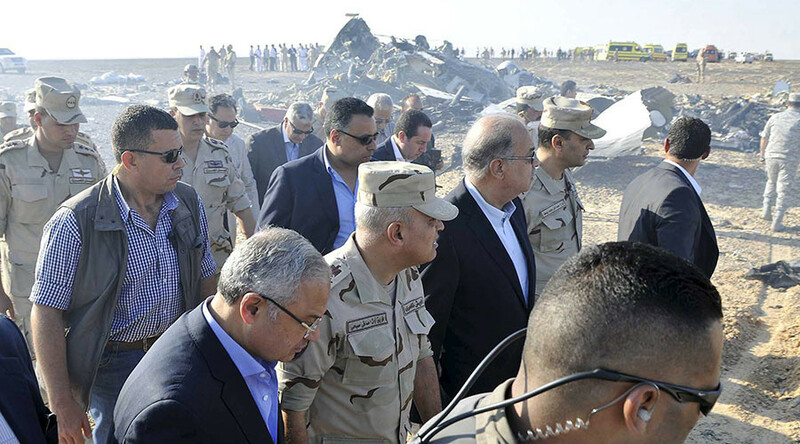 The pilot of the crashed plane did not report any emergency to flight operations officers at Sharm El-Sheikh International Airport before the catastrophe, the Egyptian civil aviation minister Hossam Kamal said. “Communication between flight operations officers and [the] Russian aircraft was carried out in normal way up to the moment of the catastrophe," he said at a press-conference in Cairo, stressing that the pilot had not asked for help and the plane “suddenly” disappeared. There is no point in hypothesizing about the cause of the plane crash until there is reliable data on the circumstances, the Russian Air Transport Agency said in a statement, adding that the plane was cleared for flying and that no technical irregularities were spotted prior to takeoff. The ministry also confirmed there were no specific flight restrictions over the area. The Russian Investigative Committee said it was examining fuel samples from the crashed plane's last refueling stop in the Russian city of Samara. Two experts from French civil aviation safety investigations authority BEA are expected to arrive in Egypt on Sunday, along with six representatives of Airbus. Meanwhile, German carrier Lufthansa and Air France-KLM have decided to avoid flying over the Sinai peninsula while they wait for more clarity on what caused the Russian airliner to crash in the area. A claim was spread online that Islamic State militants were behind the passenger plane crash, but Egyptian officials have ruled out the possibility of an attack on the airliner. According to Egypt’s security forces, as cited by Reuters, a technical fault is likely to blame for the crash. The Saturday crash in the Egyptian skies became the deadliest in Russian and Soviet aviation history, surpassing the 1985 disaster in Uzbekistan which killed 200 people.